First of all, let’s go through some facts about subjects of representation in art. A completely accurate evidence of what preoccupied the first sapient mind does not exist, however very close presumptions suggest that the first subjects of depiction were animals. In fact, animals were not only carved in stone and painted on rock by the Homo sapiens, because allegedly even the wise man’s far less intelligent cousin Neanderthal, whose capacity for abstract thinking was not that admirable, managed to draw seals, which he used to eat back in the day. It seems like people had a need to represent what they found familiar, such as animals, who have been their strange, silent companions for millennia, their food, their clothes. Much later, and throughout the history, people were painting, drawing, filming all possible kinds of things, their skills improved, their perception of the world changed so much that it cannot even be talked about. Still, one thing did remain the same in human endeavor, and that is to try to illustrate what they do not know. And that too, is something I take the risk of being wrong for, but believe that even our primal ancestors felt, when they were painting animals, probably with their (the animals’) own blood. There is something perplexing about animals. John Berger, the English artist and critic, wrote an essay about it. About how animals are like humans, but at the same time, are not. We see our own reflection in their eyes. We look at them, and they look at us, but the look that they return is not human. Still, it is a look, something we humans give unbearable significance to. Therefore, let us presume that from the very beginning of human need to produce image as such, we were indeed trying to represent, and that is to record, to remember, to describe – and in the end to explain to our own selves – something that we actually were not certain of. After this quite long and admittedly circuitous foreword, you may ask yourselves, although you probably already sense it, how is all of these related to the UFO phenomenon in art. To that question, the Wikipedia provides part of an answer: An unidentified flying object, or UFO, in its most general definition, is any apparent anomaly in the sky that is not identifiable as a known object or phenomenon. Very clear and precise. However, what an unidentified, and especially flying, object means to humans as socially developed species who are still fascinated by things they cannot do on their own, is way beyond the range of concerns of this definition. Theories about existence of life which does not come from Earth have been around for quite a long time, but have of course been popularized with the emergence of television, and the internet later. Science does regard this topic often, especially the branches related to the questions of the universe and such, and several notable scientists, among whom is Stephen Hawking, stand behind theories which prove that it would be improbable for life not to exist somewhere other than Earth (Wikipedia). Still, it seems that for us to know for fact that there are other species in the universe apart from the ones we know of, will take quite a while. 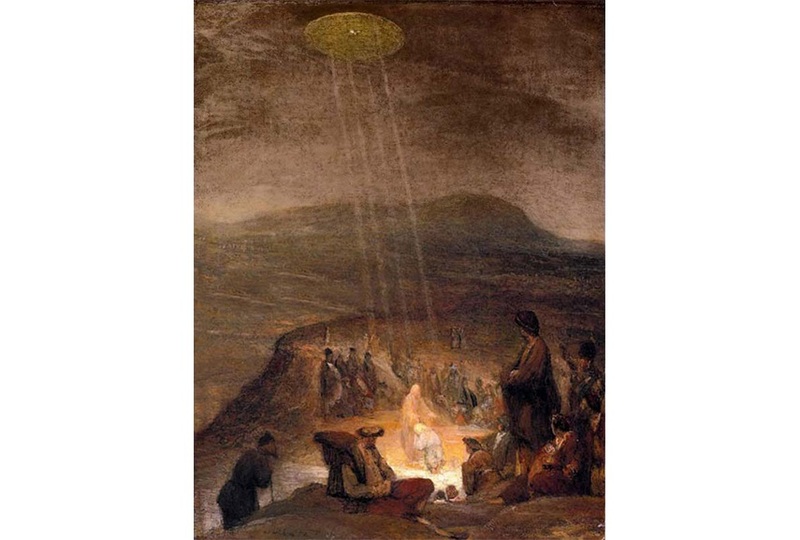 UFO in art – is it really a thing? So what do we do instead? We fantasize about them. Or do we? There must have been a moment in your life when you thought you saw, well, if not a UFO, than at least a strange cloud. Suspicious aircraft. A floating ball of light? Apparently we (and by we, I mean our modern society) are not the only ones who sometimes get confused. And this does not, obviously, stand for the hoaxes, the strange messages in crop fields, or the conspiracy theories some people believe to be true, which suggest that the government knows that the truth is out there, but simply does not want to share it with the rest of the world. The UFOs have, as a matter of fact, found their way to be related to art from other times of history. 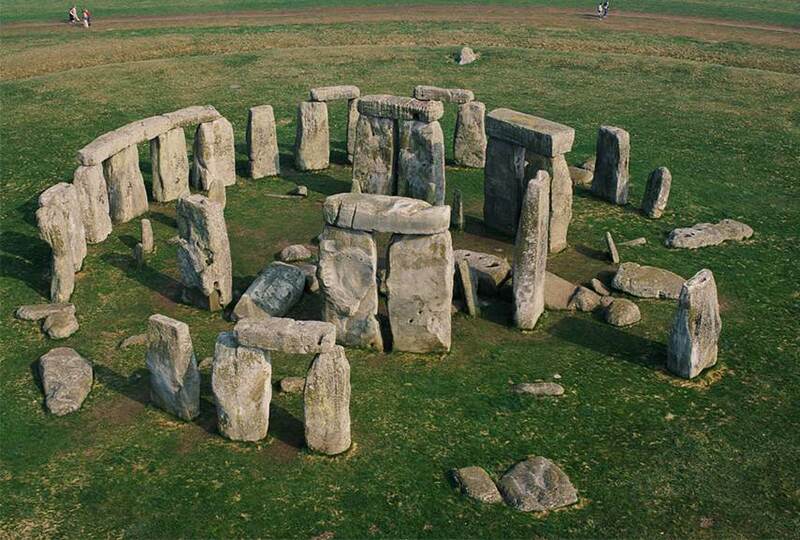 For some reason, certain people believe that there is a line of works that show traces of unnatural occurrences. 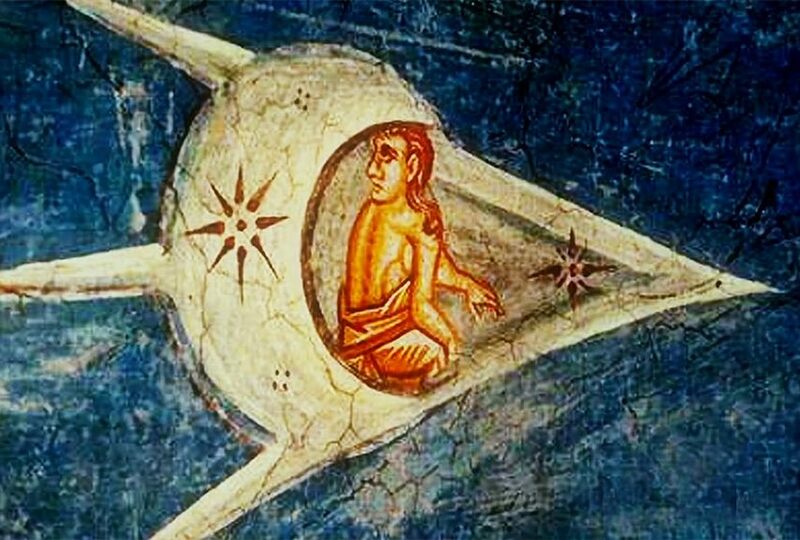 For example: A moderately famous suspicion that the fresco from the medieval Visoki Dečani Monastery displays UFOs is quite odd. Still, if we choose to ignore some of the (very important) circumstances, the analogy could be legitimate. After all, when it comes to believing in life beyond Earth and in life beyond life, there is something strangely similar, right? 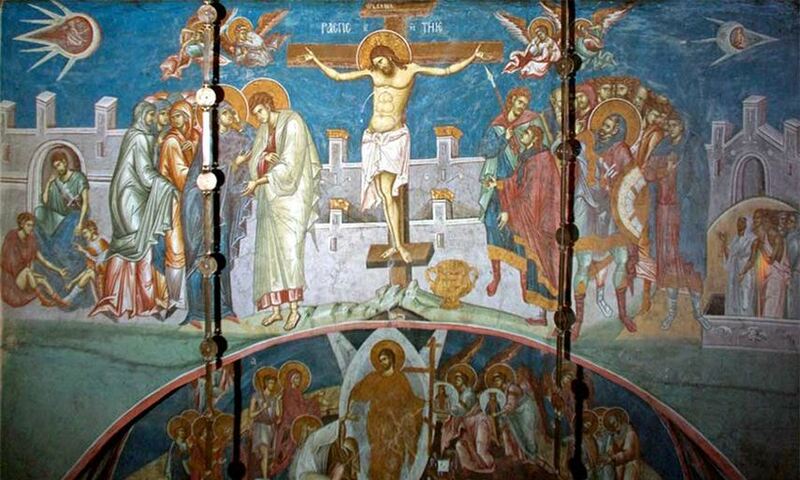 However, to get back to the subject, the fresco belongs to an established religion, whose symbols are biblical and belong to aesthetics of the sacred, rather than the secular. That is why this strange phenomenon of displaying objects that (kind of) look like UFOs is completely confusing. Could it, by any ridiculous chance be, that at that time, people were also experiencing strange encounters with something they thought was not of this world? And if they did, how did that relate to the religion they were practicing? The contemporary man would not have a problem with believing both in God and aliens, but the collective mind has evolved so much since the time this fresco, and similar examples, were made. Of course, religious art is very easy to analyze from this particular perspective. 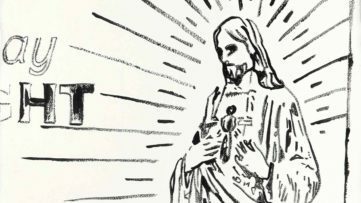 Many of the “proofs” appear themselves, because, naturally, Christians represented the sky – a lot, and of course that some of the items placed in the picture, especially if drawn by someone less experienced, or someone with a very unique perception, appeared as alleged UFOs. 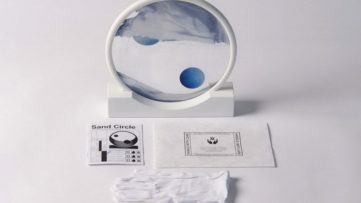 As it turns out, Visoki Dečani’s “UFOs” actually represent the Sun and the Moon. But apparently some other surreal depictions appeared through the world’s art history. The traditional Oriental art has some of its own additions to this endlessly interesting quest. 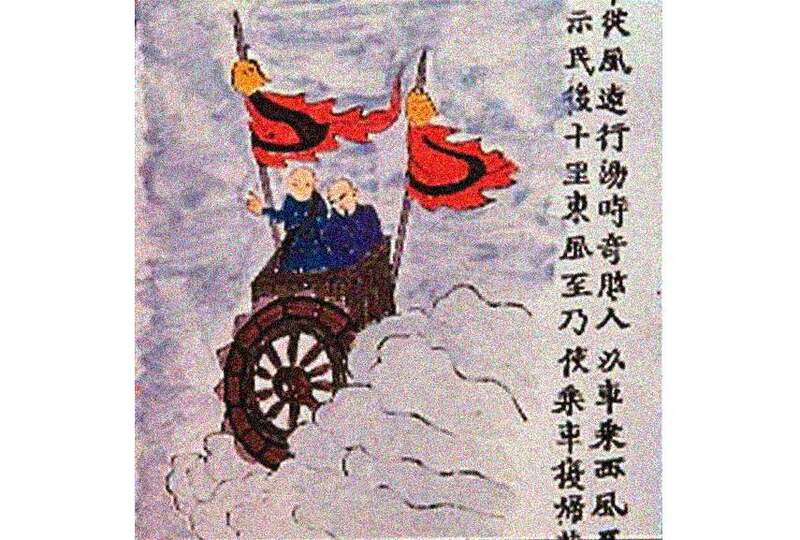 There is an illustration from an old Chinese book, whose title is “Illustrated Survey of Weird Countries” (or at least the Internet says so). The original caption of the picture itself was: ”Ji Gung Land: The people could make flying cars that travelled far with a suitable wind. In Tarng’s day (c.1700 B.C. ), Ji Gung people flying a car on a westerley reached Yew Jo. Tarng dismantled their car so it could not be demonstrated to the people … Later an east wind came on which he had them fly the car back to their own country [5,000 km] west of our gateway” (something that would probably take less time saying in Chinese). The descriptive caption of the illustration, however, is such an inspirational narrative, that it actually gives the idea they knew something we don’t. Today, there is a huge number of websites that deal with this subject, but almost always with an amateurish approach. Although there may have actually been a few quite veracious depictions of something reminiscent of an alien-like entity, there obviously are certain amounts of people who browse art, and search for shapes that accidentally happen to look like what we now imagine as a UFO. 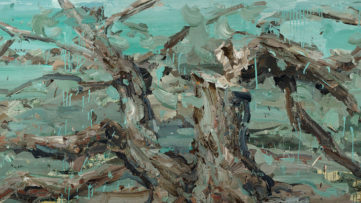 At least to the people who are seriously inclined to believe that there is something out there, much more interesting are the narratives of these paintings, like the Chinese one, which do not actually depict an object, but tend to transmit a message we cannot translate into shape. Otherwise, any other belief is actually just ignorance, poor judgement and lack of knowledge, and chopped up pieces of art are just being used to prove something they actually have nothing to do with. But apart from these, usually silly, examples – do we believe? Faith, whichever form it may take, has obviously empowered human spirit since who-knows-when. And to some extent, believing in God, believing in science, believing in humanity, is all the same. In the end, believing in life beyond Earth, is also just one of the things that we want – or rather – that we sense the right, to believe in. As for art, once again, let us remember that people have this urge to describe things they do not know for sure, but would like to understand. The things that they hope can bring them some answers, or maybe, simply, make them feel less lonely, whether it be something they actually saw or thought they saw, or the animal they look at but do not truly understand. 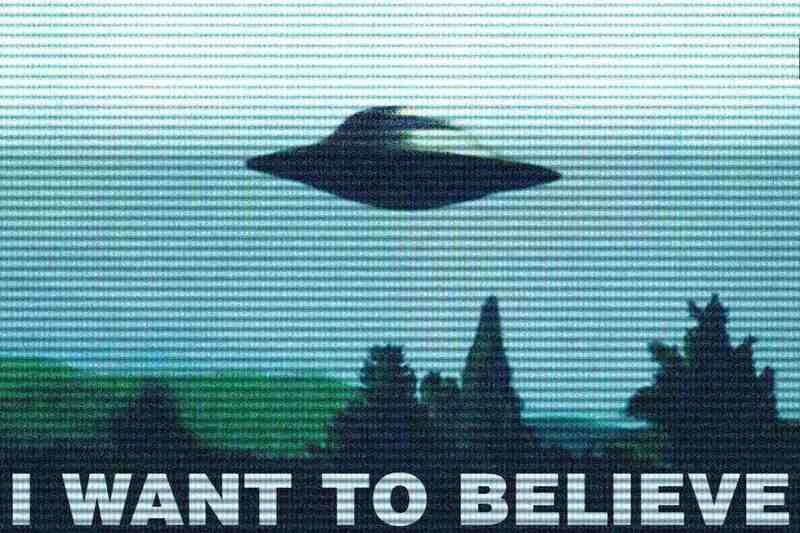 Featured image: Illustrative, source: Tumblr, with reference to The X-Files: I Want to Believe. All images used for illustrative purposes only.